Happy Friday! Hope everyone is having a wonderful summer so far. We have been incredibly busy. And I have been sewing non-stop, hence the lack of posts. I am here to share some of the things that I have been sewing, but had to keep secret for a while. Since all the baby showers are over with, I can share and not spoil the surprise. All of these items here are what I made for my cousin and her husband, who is a Navy helicopter pilot. Some were surprise gifts. Others were things that they ordered. I had a blast making everything. Though my husband and sisters might have otherwise to say while I was in the throes of making everything, and when things weren't just working as it was supposed to. They have a nautical theme in their nursery, but also want to keep it so they were able to change the accent colors as their family grows. So we came up with using navy blue and white as their base. Then we added in their current accent colors with the sheets. The navy and white polka dots are the crib skirt. For her shower my family gave a blanket and a set of bibs. And I couldn't resist making a few extra bibs in our Alma Mater. My cousin's sister sent me a picture of something special she wanted created for sister. It was a diaper bag made out of a Navy flight suit. We didn't have a flight suit or patches, but we started brainstorming and this is what we came up with. I modified a pattern I found. Made the patches from some embroidery designs purchased and made by me. And this is what we came up with. I'm calling it the Military Diaper Bag. There are usable zippered pockets on the front. Two large slip pockets on the back with a long adjustable crossover strap. There are two magnetic snap closures to help keep everything inside. The inside has five pockets total. Two decent slip pockets and three elastic pockets. I am very happy with how this Military inspired diaper bag came together. And my cousin and her husband loved it! It has received many 'likes' and 'I want-s' and 'Loves'.....so without further ado. It is now listed in the Etsy shop. It can be fully customized. 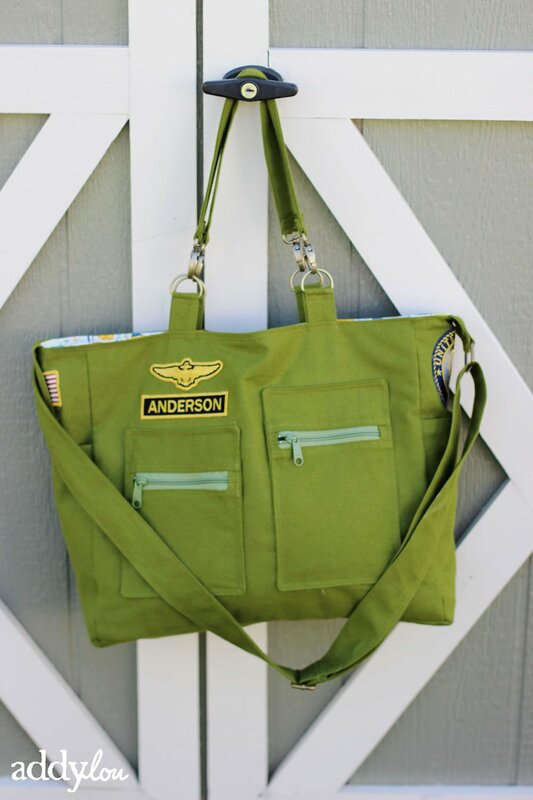 Even if you don't want the military diaper bag look, we can change it up to make it how you want it. Feel free to contact me about a custom listing to fit your needs. Hope you have enjoyed! Like I said earlier, it's been crazy trying to get all this sewn with some other orders I will be posting about later. So please forgive me. I am hoping once we get back to our normal school schedule, I can be posting more often.